Say that I want to check the signature of DBMS_METADATA.GET_DDL. If I’m in an IDE, I can simply type the package name, press the appropriate short-cut key to bring up the package signature and then search for the member of interest ( in this case the GET_DDL function). It’s by no means the largest package in terms of members ( DBMS_BACKUP_RESTORE has over 300, for example). The first argument has a NULL argument_name, but we can see that it’s an OUT parameter. This is, in fact, the return value of the function. Incidentally, if you have a look at DBA_ARGUMENTS, you’ll notice that there is a DEFAULTED_VALUE column, Unfortunately, up to and including 11gR2, this is always blank. According to the Oracle Documentation, this column is “Reserved for future use”. Anyway, we now have a relatively simple query that we can use to get the information we want. Now we need to make it a bit more convenient to access. After all, we don’t want to have to type the query out every time if we can help it. In order to make this information a bit easier to get at (i.e. avoid the need to type out a query such as the one above every time), let’s create a pipelined function. …and then the function itself. Incidentally, I did write something a while ago on the subject of pipelined functions. In the course of my reasearch, I noticed that all of the examples of pipelined functions use explicit cursors. So, just for variety, I’m going to use a cursor for loop here, just to prove that it works. -- specified. So, we need to see if we're starting to describe a new object. The functionality is fairly similar to that of DESCRIBE itself in that we first evaluate whether we’ve been passed a synonym and, if so, then resolve it to the underlying object. We then loop through our query ( using the funky for loop). As well as functions, procedures that take no arguments can also have null argument_names so we need a bit of logic to determine which is which. Finally we pipe back the results. A point to note here is that you can’t pipe the cursor record variable itself. You need to use a variable of the appropriate return type. In addition, we’re using the ALL_ARGUMENTS view rather than it’s DBA counterpart. This is because we want to make the function available to users who may not have privileges to the DBA views. We’ve also created the function with Invoker’s Rights (AUTHID CURRENT_USER). This ensures that we don’t override any grants to users and make available database objects that would not otherwise be visible to them. …or possibly not. Public grants and synonyms tend to illicit a fair amount of discussion in database circles. So, maybe you’d want to grant execute explicitly to individual users (or even a role). The same may apply to the synonym – you may prefer to dispense with it altogether ( and call referencing the owner) or create private synonyms as appropriate. For the purposes of this particular post, I’m going to sit cat-like on the fence and feign complete disinterest. Well, it seems to return the required results. However, the formatting could do with a bit of cleaning up for SQL*Plus. Now, we could go and make some changes to the function itself. However, as it stands, it can be useful in any Oracle client environment, not just SQL*Plus. So, a better solution would be to …. You can do a fair bit to customise your SQL*Plus environment. As well as getting in on the fluffy kitten theme, William Robertson has a great article on customising your SQL*Plus environment…although his cat looks a bit older and I’m a bit disappointed that it doesn’t seem to have mastered the art of touch-typing. Have a look at his home page and you’ll see what I mean. If, like William, you want to have your own personal settings (for SQL*Plus that is, not cats), you can create a file called login.sql. In order to get this file to run every time you start SQL*Plus, you can define the SQLPATH environment variable on your OS to point to the directory that login.sql is located. 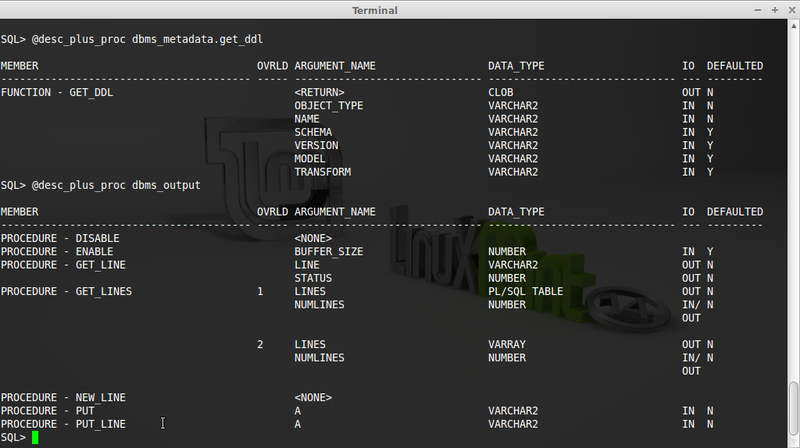 Finally, I can put my login.sql script in the sqlplus_scripts directory and it will always run when I start SQL*Plus. You may be wondering what exactly this has to do with our pipelined function. Well, now we have the SQLPATH set, SQL*Plus will look in here to find a file that we’re trying to execute. With this in mind, we can make our describe package member function just that little bit more user-friendly. In the new sqlplus_scripts directory, I’ve created the file desc_plus_proc.sql, which does several things. -- sort out the argument we've been passed. -- the SQL*Plus variables we've just declared. Of course, if you simply must have this functionality back in the comfort of your IDE, you’re free to use the pipelined function and customise the output accordingly. In the meantime, the command line becomes just that little bit more…well, cute and fluffy. This entry was posted in Oracle, PL/SQL, SQL and tagged all_arguments, authid current_user, break on column, clear break, clear column, column format, create type as object, create type is table of, dba_arguments, dba_arguments.defaulted_value, dba_procedures, describe, login.sql, select from table, set feedback, set lines, set pagesize, set verify, SQL*Plus, sql*plus variable, SQLPATH, store SQL*Plus settings, undefine variable by mikesmithers. Bookmark the permalink.